It’s January 1853 and seventeen-year-old Annie Stride is standing on Waterloo Bridge looking down at the River Thames, contemplating suicide. Having grown up in the East End of London as part of a large and impoverished family, Annie has drifted into a life of prostitution. Her only friend, Mary Jane, drowned in the Thames the previous year and now, pregnant and homeless, Annie has decided she has no choice but to do the same. Just as she gets ready to jump from the bridge, she is rescued at the last minute by a handsome young man who introduces himself as Francis Maybrick Gill. Francis is a talented Pre-Raphaelite artist who is planning a new series of paintings on the subject of the ‘Fallen Woman’ – and he wants Annie to be his model. And so Annie, who had been only moments away from death, finds herself living with Francis in his large and luxurious Gower Street home, posing for portraits of Eve, Rahab and Jezebel. As well as using Annie as his muse, Francis also takes steps to improve her mind, to correct her East End speech and to help her with her reading and writing. She has no idea why he is taking so much interest in her, but she is so grateful she doesn’t care – until late one night two visitors come to call and Annie begins to wonder whether Francis Maybrick Gill is really the man she thought he was. 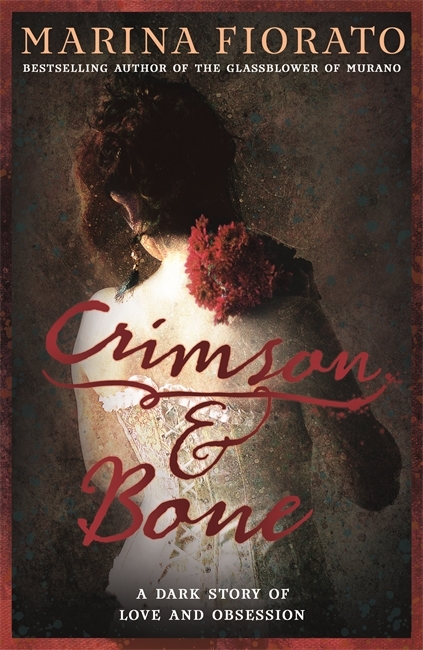 Crimson and Bone, Marina Fiorato’s latest novel, is divided into three parts and everything I have described above happens in the first part alone. The action also moves away from London for a while to Florence and Venice; Fiorato, who is half-Venetian herself, always writes beautifully about Italy and we are given some lovely, vivid descriptions of the country. The author’s love of art also shines through, with lots of information on the Pre-Raphaelite approach to art, exhibitions at the Royal Academy, the symbolism in the paintings for which Annie models, and, through the character of a mysterious ‘rainbow man’, the origins of the paints and pigments Francis uses. From the beginning, the reader is kept in the dark as to Francis’s motives. What are his true plans for Annie? Does he really just want to paint her or does he have some other reason for his sudden interest in her? And what is the significance of his obsession with white camellias? A series of diary entries written by Annie’s friend Mary Jane appear at the start of each chapter which eventually shed some light on things, while also raising more questions along the way. It’s obvious that something is not quite right with the whole situation, but we don’t know what or why and the tension builds slowly throughout the novel. However, there are a few inaccuracies and anachronisms which do spoil the book somewhat – for example, Annie tries to improve her speech by listening to gramophone records (several decades before they would have been available) and is taken to the theatre to see performances of Pygmalion (not staged until 1913) and Adelaide Neilson in Measure for Measure (more than twenty years too early). Admittedly, not knowing anything about Adelaide Neilson, I wasn’t aware of the third one until someone else pointed it out in their review, but it makes me wonder what else I might have been too caught up in the story to notice. And the fact that I became so caught up in the story and the atmosphere – and that I cared about what happened to Annie – meant that I did enjoy this novel overall, despite its flaws. This is book 15/20 of my 20 Books of Summer challenge. Those mistakes would have driven me crazy. They should have been picked up by an editor, but it seems that such beasts hardly exist nowadays. There’s no excuse for it, especially with the internet making research so much easier these days. It’s a shame, because I did enjoy everything else about the book! Anachronisms don’t usually make me stop reading either, but they are annoying! I loved the artistic elements of this book, so if you like the Pre-Raphaelites I’m sure you would find a lot to enjoy. It’s the laziness behind the mistakes that would bother me. It’s not that hard to check the dates on some of these things. No, it shouldn’t be difficult at all. I can’t understand how the editor didn’t notice any of those things. Do you think anyone really edits books anymore? I get the impression that editor is now more likely the title for a book marketer. Maybe they make suggestions for improvement of drafts, but I don’t know that anyone carefully checks books anymore. I read it not that long ago, and the errors leapt right out at me – all the ones you found, plus a couple more – cremation wasn’t legal in this country until the 1880s, and the fact that the Italian villa wasn’t connected to electricity wouldn’t be surprising given that London didn’t begin to be connected for another thirty years or even later! I agree, the author and editor should be ashamed of themselves, especially as Marina Fiorato claims to have a history degree from Oxford (I don’t know what the standard of teaching there could have been, but my more humble university was scrupulous about drumming into us the importance of correct research). It took me all of five minutes on Google to check the facts (I’m not a Victorian expert). And someone on Amazon picked up that the names had echoes of a Jack the Ripper suspect and victim. Like another reviewer there, I was left wondering if the story had originally been set thirty or forty years later, and the time-frame changed to bring in the Pre-Raphaelite connection, without bothering to remove details that had now become anachronistic. I know it seems pedantic, but I do feel very strongly about this. One of the reasons less enlightened people sneer at historical novels is the perceived prevalence of sloppy research. And if you write a novel, whether it’s historical, crime, fantasy or even one set in the present day, you are creating an illusory world and inviting your readers to step in. Get something obvious wrong, and the reader is immediately jolted out of your world and back into reality, reminded that what you’ve constructed is fake. It’s not just laziness, it’s also contempt for your readers (I’ve seen authors quoted as saying, ‘oh, I don’t bother because my readers don’t know/don’t care’). You owe it to them, even more than to yourself and your characters, to ‘get it right’ – or as right as you possibly can. The cremation one didn’t occur to me, but now that you’ve mentioned it I do remember the line about the villa not having electric. It’s an interesting thought that she could have intended the novel to be set in a later period at first, though surely somebody should still have checked the finished version. I did still find the story itself quite enjoyable, but I certainly understand your feelings about the historical errors, both in this book and in general. It’s a shame because readers shouldn’t really have to question the accuracy of what they are reading – they should be able to trust that the author has checked the facts and made an effort to get everything right. It sounds a good read – but I’m not sure I could settle with the inaccuracies. I have just read a book, enjoyable but had the prime minister at the start of World War Two as someone completely different. In some ways I could forgive something a couple of hundred years ago but something that happened merely 70 and with people still alive who remember it is simply plain lazy. That sounds even worse than the inaccuracies in this book. It’s such a shame when you’re enjoying the story and then come across something like that!